2 negatives : b&w; ; 120 mm. Published in Rafu Shimpo, July 11, 1969, Japanese section. 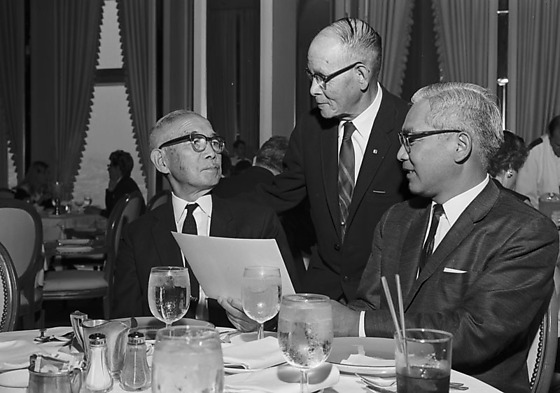 Consul General of Japan, Kanji Takasugi, Katsuma Mukaeda and Shunzo Kido at the Blue Room of the Music Center of Los Angeles County, Los Angeles, California, July 8, 1969. Kido, left, and Takasugi, right, sit at table looking at sheet of paper as Mukaeda stands in between men. All wear suits and eyeglasses. Typed on original envelope: Kido, Mr., Mudaeda and Con Gen -- Music Center Blue Room. Shunzo Kido was on the Japanese Equestrian team at the 1932 Summer Olympic Games held in Los Angeles, California. He was leading the steeplechase event, but noticed that his horse, Kyu Gun, was fatigued and dropped out of the race rather than risk injury to the horse. Two years later the Riverside Humane Society dedicated a plaque to Kido on the Friendship Bridge in Riverside, California.